On June 7th 1956 at 5:00 p.m., the Schoellkopf Power Station sustained a catastrophic collapse which destroyed two-thirds (2/3) of the plant. Six generators capable of producing 322,500 horsepower had been demolished. Damage was estimated at $100 million dollars. The most devastating was the sudden loss of 400,000 kilowatts of power from the power grid. To replace the Schoellkopf Power Station, the New York State Power Authority committed itself to the building of a new power station along with a giant reservoir further downstream near Lewiston. 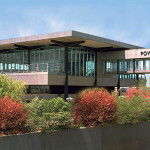 This power plant was estimated to cost $800 million dollars and would take three years to build. 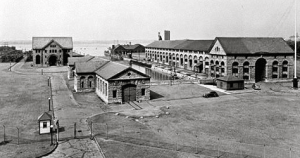 Robert Moses was the head of the New York Power Authority and would oversee the building of this new plant. Moses’ first step was to establish that the building and operation of the Niagara Power Project would come under the ownership of the New York State Power Authority. In August of 1957, the U.S. Congress approved the building of the Niagara Power Project with the capacity to produce 2.4 million kilowatts. Land for the reservoir was expropriated from the Tuscarora Indians. Construction began on March 18th 1957. During construction twelve million cubic yards of rock was excavated. The main structure of the power station was 389 feet (118m) high, 580 feet (177m) wide and 1,840 feet (561m) long. The Niagara Power Project was renamed the Robert Moses Power Generating Station after its builder, Robert Moses. 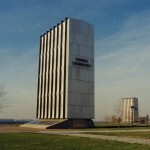 The Robert Moses Niagara Hydro-Electric Power Station of the New York State Power Authority was opened in January 28th 1961. 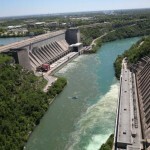 It is the largest of the Niagara generating stations. 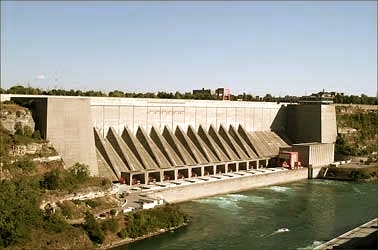 Water for this power plant is drawn from the Upper Niagara River 4 kilometers above the Falls along the American shoreline. 2.27 million liters of water per second are drawn through two 213 meter long intakes located below river-water level. Twin buried tunnels, 14 meters wide and 20 meters high, lead from the intake station and run 6 kilometers to the fore-bay. Each tunnel has a 400,000 kilogram vertical lift gate and each is housed in a structure 15 meters wide and 20 meters high. The water is held in a large lake-like reservoir next to the power station.